Everyone should have a Rescue Throw Bag in their boat regardless of size or type.The Inflatable Boat Center stocks Rescue Throw Bags at an affordable price, so any boat operator shouldn't have an excuse why theirs is missing from their boat.Buy at least one today. is a great value… maybe the best around. Seasoned mariners will tell you that many boaters seldom have enough lines aboard and simplicity is the essence of the Maxxon Outfitters Rescue bag. The 3/8" inch floating line has a tested tensile strength of over 1,300 lbs. 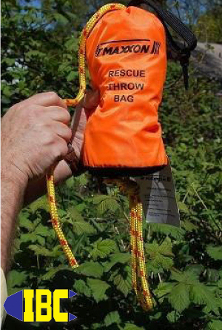 and the bright orange bag color makes our rescue line easy to see on the water. The base loop handily attaches to a cleat or hook for quick access. After each use, simply feed the line back into the bag, as you would have it play out and your bag is ready for action.